: Alfie makes his TV debut! Alfie makes his TV debut! Let me introduce you to Alfie the bedbug sniffing megadog. I'm not sure if any of you in the UK have already seen it but there is a four part series on BBC 2 'The Lady Killers' about women in the pest control industry. There's not many women working in the industry and one of them is one of Hubby's partners. The company is Trust K9 and is made up of 3 humans and 2 talented dogs Alfie and his son Dex. It's in episode 1 that Claire and Alfie make their debut which went out last Wednesday. Alfie was a hit. He wore a camera on his harness which meant we got a dogs eye view of what it was like when he is darting around all over the place sniffing out bedbugs. Later in the episode Claire shows Imogen another pest controller how to do a heat treatment to eradicate them. Click on the link below to read the review in the Daily Mail by Christopher Stevens. I would love you to check out the link below to the show. Feel free to watch the whole episode but Alfie first makes his appearance at 2:43 and then the heat treatment is a little bit further on in the episode just after 29 minutes. Hubby and the rest of the team took over the company a year and a half ago and I had a post all lined up about it but as I was in the thick of my studies it never got published but I'll tell you all about Trust K9 and their fight against bedbugs another time. If you want to check out some other videos and show your support it would be lovely if you subscribe to their You Tube channel, (it's a work in progress). Let me know what you think of our boy Alfie in the comments. Oh you can read more about Trust K9 K9 if you click on the menu tab at the top of the page. Stopping in from SITS Girls Sharefest. What an amazing story! I've Pinned and followed you everywhere... I'll be in London in June... can't wait! Thanks for stopping by Mila. He was a little star. I have to be honest, I only watched the bits on bedbugs and with Alfie and the Trust K9 team. Thank you for sharing Alfie and his talents on Idea Box link party! Hope to see you again next Thursday! Love it! I feel my little puppy Molly needs to have a camera on her collar! Maybe she could become famous too! I think she does! It would be interesting to see what mischief she may get up too. I've always wanted to set up a camera to see what they get up to when we're out. Although knowing our other dog Spike, he'll be sleeping most of the time. Kate, how cool is this! 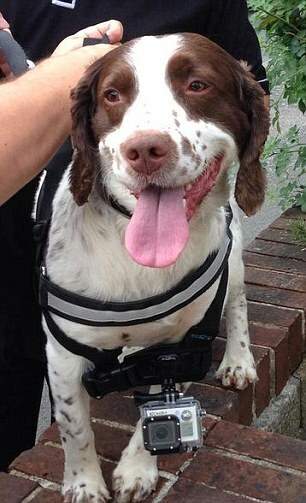 Not only does Alfie have a special talent, he is now famous! You better start wearing large sunglasses and a big hat when you take him out to walk him! Congrats! Awesome dog! Thanks for linking up and sharing with us at Funtastic Friday. I hope you can make it again this week. How to add an email me widget to blog. Personal Planner Unboxing and a 15% discount code for you! Back to blogging and Etsy shop love. Filofax Fun: My Kikki-K part 2. Get my new posts straight to your inbox! Stay up to Date with Our Email News Latter Just Subscribe our Blog via email & Get Daily Updates. We Promise that Your email will be kept private and never shared with anyone. I respect your privacy. You may unsubscribe at any time with just one click.